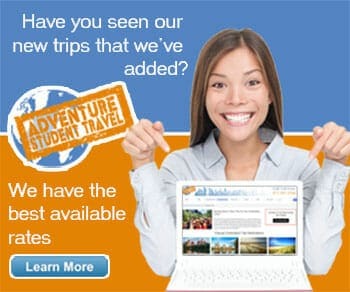 At Adventure Student Travel, we help you along the way with every aspect of a school trip you could possibly think of. But when it comes to choosing chaperones, the students’ teachers are the go-to source for choosing parents and fellow colleagues who will be the best choice for their class trip. There are many qualities that a teacher should look for to ensure their students will have a safe, fun, and educational trip that goes off without a hitch. An effective student travel chaperone will be one who is fair, firm, and comfortable with the age group of the students, and understands the usual behavior expectations of the school. To start, you should considering pulling parent chaperones from those who consistently volunteer in the classroom, are involved in Parent-Teacher Organization, or who you know on a closer level than some of the others. The more trust you have in a parent chaperone, the better! You should always wait until the student count is finalized so that you can balance out the best number of chaperone-to-student ratio. Consider creating a chaperone application curated with questions applicable to your trip to narrow it down to the best options. It may be a good idea to balance out the male-to-female ratio as well, as some students respond to discipline more easily with someone of their own gender. However, be sure to clarify with the other chaperones that they are comfortable with that setup to avoid any uncomfortable situations. Of course, parents may not be the only group you're looking to for a chaperone. Other teachers within your school system may be a wonderful addition to the team of chaperones, especially if your trip is mainly educational. If you're choosing from teachers, it may be best to select a range of different grade levels, so that each may have a new and interesting take on historical and educational knowledge of the destination. Finally, it can be beneficial for both the students and the teachers to choose educators at different points in their careers – newer teachers may be more eager and excited to help out, while more experienced teachers may have a better grip on how school trips function. A great balance goes a long way! If you want to mix both students and teachers, you may sometimes find that it can create the perfect mix of familiar faces and new helpers. Students will feel comfortable with other teachers within the school that they know more closely, while other teachers may take comfort in knowing a few parents are on board to help keep behavior in line. Overall, the most important thing to consider is this – you're placing the responsibility of the students in the hands of these chaperones, so you want to be confident in your decision! Don’t rush, take your time considering possible applicants, and as with anything else, don’t wait until the last minute to find the perfect chaperones. Once you’re ready to go – relax! Your dream chaperone team is complete and your students can take the trip of their lifetime.